This weekend (30 March – 2 April) is Zoo Awareness weekend. It is a time for people to share their concerns about the treatment of captive animals. One area of concern is the largely unregulated mobile zoo industry. Each year more and more companies are visiting schools, youth groups, local fairs and private parties to satisfy children’s natural curiosity about other creatures. However, such events are the cause of much suffering for the creatures who are forced to perform against their natural instincts. This is stressful for the animals, who are subject to over stimulating and frightening environments, denied the freedom to fulfil their natural needs, and forced to travel long distances in small cages. Many mobile zoos are poorly regulated, not subject to mandatory inspection, and run by inexperienced ‘hobbyists’ with poor understanding of animal welfare standards. Many make use of exotic species, bought via an unscrupulous trade in wild animals where living beings are mass produced for profit. Despite claims of their educational value, in fact they miseducate the public by displaying creatures in an alien environment. The stress and isolation of captivity means that many of them show neurotic, abnormal or self-harming behaviour. QCA urges parents and teachers to refuse to support any event where a mobile zoo has been invited. Instead, we’d encourage them to organise trips to places where young people can safely experience wild animals in their natural habitats. We also ask concerned readers to lobby their MP calling for the introduction of specific regulations and mandatory inspections. It is time that we recognised that captive animals are sentient, sensitive individuals. They should be treated with respect. 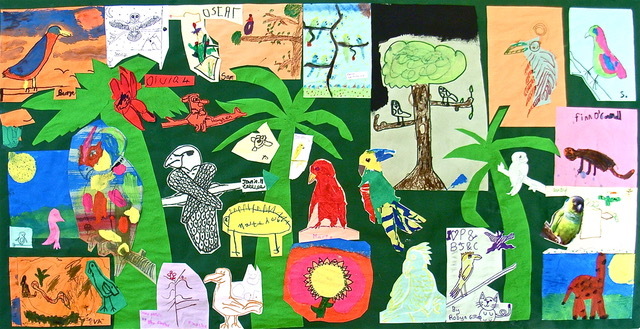 ‘The Rainforest’ is an art work (two metres wide) made by children and adult visitors to the Raystede Centre for Animal Welfare, Ringmer, East Sussex. This work was made in support of the residents of Raystede’s aviaries sanctuary for exotic birds and formed part of an 18-month residency by QCA member Ann Johnson ©.